Victoria appeared on Show 109, recorded in November 2004, at age 16. She also appeared on Season 1 of PBS’s From the Top at Carnegie Hall. 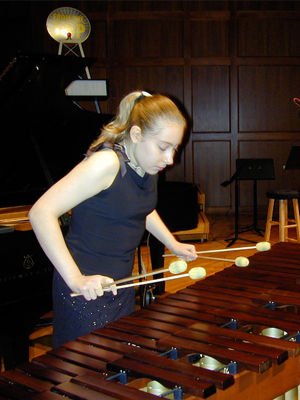 Victoria Aschheim (Marimba Duo), a 16 year old from Chicago, started her musical career playing the piano and began playing the snare drum eight years ago. As a member of the Chicago Symphony Orchestra Percussion Scholarship Group, she recently helped implement a mentoring program for the group and is excited to give back to the organization. A junior at The Latin School of Chicago, Victoria is an honor student who challenges herself with subjects like advanced Latin and Advanced Placement Calculus.